Castle Party Rentals has many new and exciting Inflatable Obstacle Courses for Rent. Great inflatable maze and obstacle course for rental. There is nothing better than one of these mazes to offer a fun experience for your guests. These challenge courses are filled with great climbs, slides, squeeze throughs, and even more and are ideal to challenge kids or adults! Reserve your obstacle course rental today at one of our three locations: Elgin, Naperville, Chicago, IL. Our Elgin Party Rentals specializes in large obstacle courses, whether they be for large festivals, school celebrations, or company picnics. The Seven Element Obstacle Course Rental challenges you through seven different type of obstacles. Whether you're challenged by the tunnels or thwarted by the logs, the Seven Element Obstacle Course is great for all ages, kids to adults. The Obstacle Course Rental has dual lanes so that participants can race one another through the various obstacles. This popular Chicago Obstacle Course is a very affordable rental for such a large inflatable. 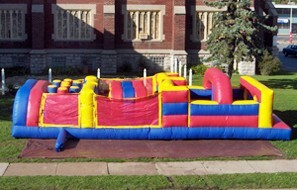 The Gladiator Obstacle Course Rental is a favorite to many in Chicago. The incorporation of many obstacles and a slide provides a fun experience. This obstacle course has been featured in a variety of children and adult events. The Gladiator Obstacle Course is a dual lane Chicago Obstacle Course allowing participants to compete against one another. Our Extreme Force Obstacle Course Rental takes your inflatable adventure to the next level. With extensive challenges, climbing walls, and a giant slide, this obstacle course satisfies the needs of kids and adults. This Chicago obstacle course rental has been popular for backyard parties, but even utilized at lartger functions. The Dragon Rage Obstacle Course Rental is new for this year. It is a very impressive inflatable ride that will hold a crowd's attention for hours on end. Unfortunately, this ride does not breath fire, so you will have to use your immagination while racing through the dragon. Enjoy this Chicago Obstacle Course Rental today! Our Pirates Cove Obstacle Course is set up much like a figure eight, each contestant completing once loop. The race is on. Be the first to make it through the non-stop adventure. Run around obstacles, watch out for those gun barrels, squeeze your way through to the back... alas, another task awaits. Climb up the rope wall and slide back down to the Pirate Skull below. This is a great choice for a Chicago Obstacle Course Rental. Get your Rush on with the Adrenaline Rush Obstacle course. Challenge yourself and someone else on this Chicago Obstacle Course Rental. This is a great team building obstacle. that will keep your family, friends and co workers entertained. The original 360° obstacle course offers 80 feet of challenges per lane including tunnels, log jams, crawl through tubes, up and over's pop up obstacles, rock climb, slides and more! The Aqua Extreme Obstacle Course Rental is sure to leave an impression on your guests. This awesome 3 piece course can be used wet or dry and configured in several ways for team or individual competition. Racing through the tropical paradice, one will encounter a multitude of challenges, detours, slopes, and slides. If your looking for one of the greatest obstacle courses on the market, then Aqua Extreme may be your answer if you are looking for a Chicago Obstacle Course Rental. The King Kong Obstacle Course Rental is quite an impressive center piece. Your kids will go bananas for Kong’s Revenge. 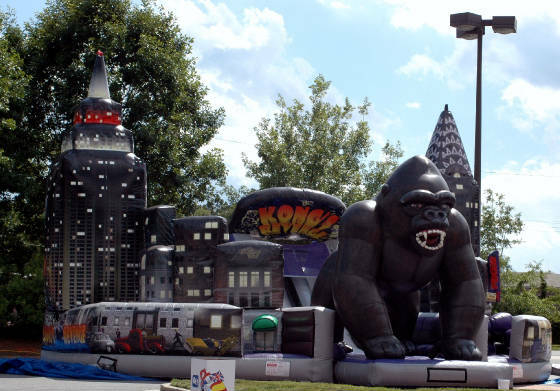 This “king” sized inflatable features an obstacle course through the city, ending at a climbing wall and a long slide down through Kong’s legs. Don’t monkey around – invite Kong to your next party and enjoy this Chicago Obstacle Course Rental. The Alcatraz Inflatable Obstacle Course Rental is, without a doubt, the most awesome inflatable obstacle course we have ever seen. Two individuals start out in different cell blocks and race through climbing walls, squeeze throughs, tunnels and slides as they try to escape Alcatraz. The final run through takes you through the legs of the huge security guard. The cell blocks are made for photo opportunities, as you can take pictures of each "prisoner" through the cell bars before they try their daring escape. The type of inflatables you have at your event not only reflect on the event itself but on you the customer and on us the amusement provider. Our latest and greatest obstacle challenge mirrors the excitement of a real rollercoaster which is the featured ride at any amusement park. Experience the twisting turns, climbing the mountains and zipping down the other side. This ride is a SCREAM! The Standard Unit is built with 3 separate sections(A,B and C). This allows the sections to be rented and configured to suit your available space and budget.